Humasol vzw is a Belgian sustainable development organization that focuses on renewable energy projects in the South, however only on request of a local community or their partners in the West. Through carefully selected projects, Humasol aims to support these communities, with a sustainable approach, on a technological and financial level in their energy provision. Doing so, we offer Belgian engineering students the opportunity to do an internship in the South, within the framework of their studies. Offer professional guidance to students. Please visit our website for more information about our organization. Geschreven door Anouk en gepost op 16 april 2012 onder Goed doel, Muziek, Party. 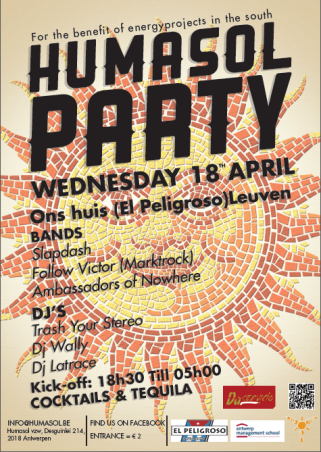 Deze post werd getagd met El Peligroso, feestje, goede doel, Humasol, Humasol Party, ontwikkelingssamenwerking. Comments Off on Humasol Party @El Peligroso op dit artikel.